I completely agree. I got caught up in the "must have high stats" BS for a few years, but coming back to Classic D&D and 3d6 in order just adds so much to characters that rolling a bunch of high stats and coming up with 2-3 pages of back story just fail to do. It's a lot faster than writing those 2-3 pages after character creation as well. Great post! Sorry for the necro, but I just discovered your blog and wanted to give this entry a thumbs-up. The flawed or limited character, potentially unremarkable but for the adventurous things that are about to happen to him is part of what brings me back to the vintage rulesets. 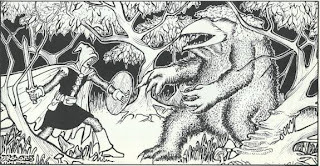 While I enjoy 3.x, Pathfinder, and 4e, I enjoy them for different reasons, and the sort of "You have a stick and a potato" nature of old-school rules scratches a different but vital itch for me.